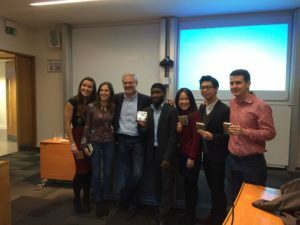 I was lucky enough to end the year on a high as I was asked by the University of Exeter’s Business School to support the MBA students during their circular economy corporate challenge, set this year by Unilever. The students were given the challenge on Monday morning which was around Unilever’s extensive hair care products range and specifically was asking about how to improve the impact of the packaging. Is it possible to make it reusable even? I went in during the afternoon to give a lecture on the technical aspects of what happens to haircare products at the end of life, both in terms of waste and water. I stayed on for the lecture on supply chains and had some interesting conversations afterwards, especially over coffee with Adam Lusby, the course leader. One of the things that Adam and I talk regularly about is the scale of ambition that one can have with the circular economy. I was introducing the subject to a new colleague recently when someone joked about it being ‘recycling on steroids’. He was joking, but all too often the circular economy is thought of as just closing the loop on material use, when in fact, it is about systemic changes in the way our production and consumption patterns work. Friday brought about the close of the challenge and presentations from each team to a panel that was made up of Gavin Warner from Unilever, Ken Webster from the Ellen MacArthur Foundation and Chris Grantham and Sally Spinks from IDEO. Ken and I helped out with a group or two in the morning, following on from questions I had received in the week by email. The presentations were fascinating and I was really impressed by the level of detail and research that had gone into each of the ideas. The teams really paid attention to the materials that were being used and suggested changes to the existing business model in their target market. The winning team proposed a combination of practical with impactful, and also nailed the presentation itself. However, the best solution is probbaly one that combines a number of the ideas the teams had, from different sized retailer packaging, through to reusable domestic scale packaging and nanotechnologies to make sure no product is left inside. I think there’s potential learning that could transfer over from the water industry as well. The following day brought Paul Polson, Unilever’s CEO to Exeter, where he spoke on the MBA Graduation Day. He talked about a number of big themes, from the Sustainable Development Goals and climate change, through to the rise of a New Asian Hemisphere. But more thoughts on that at another time!